Some of you may have already stopped reading when you saw the name Harvest Brussels Sprouts. Keep reading! This recipe will change your perception of these tiny cabbages. Show them some love. In a 2008 poll in the United States voted Brussels sprouts as the least favorite vegetable of all. But I think I can change their minds with this delicious recipe. Or maybe not. Apparently there is a gene you might possess in your DNA that makes Brussels sprouts taste bitter. 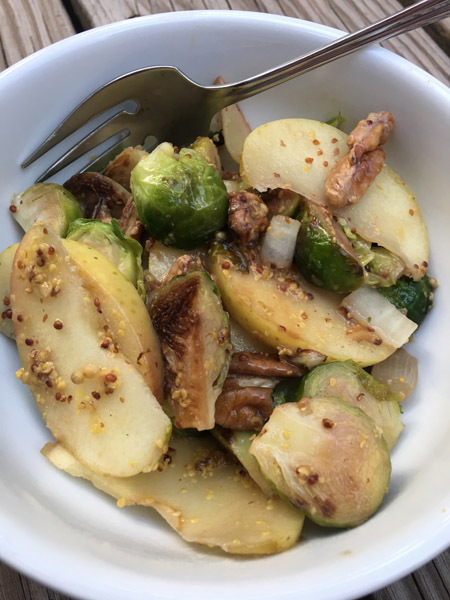 So apparently while you’re gagging your way through a big bowl of sprouts, the person across from you is chomping away on what seems to be a terrific source of vitamins and proteins. This gene even has a name. TAS2R38. What do you think? Are you a TAS2R38? 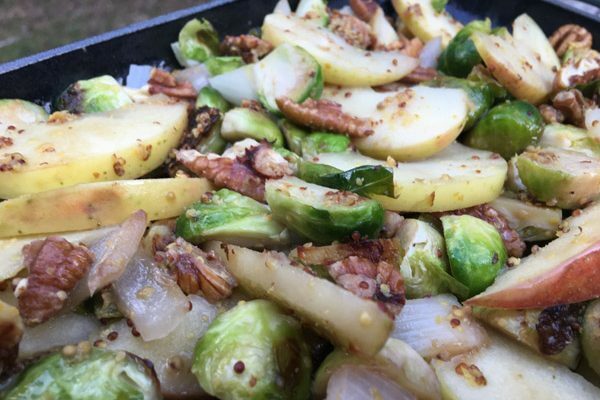 This recipe is great for your fall dinners but also a great recipe for Thanksgiving. That’s when I first made it several years ago. I have adjusted the recipe through the years enough to call it my own. I’ve taken out vinegar, changed the nuts, added the cider, and changed the mustard. I also think it would be good with some dried cranberries, too. With all these seemingly desperate modifications, I have to admit that I, too, don’t like Brussels sprouts very well. Anything to doctor the taste to help me eat these nutritious greens is a good thing and this recipe is a good thing. Heat oil in a skillet. 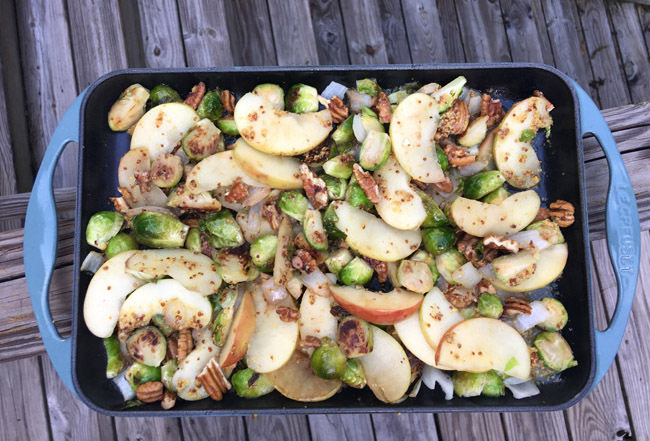 Add Brussels sprouts and cook for 7-10 minutes over medium heat. Next add the onion and cook 10 minutes more. Add apple and pecans and warm through and apples are slightly softened. In a small bowl, mix together the apple cider, mustard and brown sugar. Stir mustard sauce into Brussels sprouts. Serve warm.